You are here: Home / Evidence-Based Living / How much alcohol is too much? A glass of wine with dinner. A beer at a barbecue. For decades, the U.S. Dietary Guidelines advised that drinking in moderation would not lead to medical problems for healthy adults and may even improve heart health. 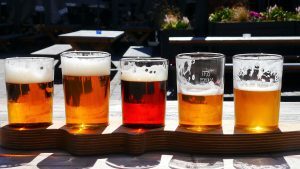 But a new analysis published last month in the British journal The Lancet calls into question the idea that an alcoholic drink or two a day is harmless. At the same time, critics say the review does not account for other factors – such as diet, exercise, and socioeconomic status – that may influence a person’s overall health. The meta-analysis combines data from 83 studies and a total of nearly 600,000 participants. But it makes a new comparison. Previously, research on alcohol compared the health of drinkers to non-drinkers. But scientists found a problem with this approach; some people do not drink alcohol because of specific health problems, such as alcoholism or cancer. In comparison to drinkers, non-drinkers may be in poorer health from these medical problems. Comparing the two groups may make drinkers look healthier than they actually are. The new analysis took a different approach. It compared lighter drinkers to heavy drinkers. The researchers wanted to answer the basic question: How much can people drink before they increase their risk of dying? The analysis also demonstrated that the more someone drank, the greater their risk of dying. Researchers found people who drank seven to 14 alcoholic drinks a week lowered their life expectancy by about six months, people who drank 14 to 24 drinks a week lowered their life expectancy by one to two years, and drinking more than 24 drinks a week lowered life expectancy by four to five years. Looking at specific diseases, alcohol consumption led to an increased risk for stroke, coronary disease (but not heart attacks), heart failure, fatal high blood pressure, and aortic aneurysm. Moderate alcohol consumption did lower the risk of having a heart attack. But there are elements involved in health and nutrition that the new analysis was not able to consider. For example, people who drink heavily are more likely to smoke cigarettes, eat unhealthy foods, and forgo exercise. So it’s difficult to discern if drinking is the problem, or whether other lifestyle choices are impacting health outcomes. The take-home message: Yes, alcohol consumption at lower levels may have more of an impact on health than we currently understand. But there are a broad range of factors that inevitably contribute to each person’s wellbeing.